For me, an axe is a sign of masculinity! Have you ever seen a dull-looking guy chopping woods? No? Me neither. You’ll be surprised to see the versatile use of a good axe and how effective it can be. Whether you are a normie or a pro at buying axe, this simple guide will help you to better choose the best tool for your wood. This is a guideline and review based on personal experience while using the axes as well as how other buyers have reacted to its usefulness. After going through this guideline you’ll get a clear idea of what you should look for in your desired axe. Follow these step by step details to sync with your purpose of using the axe. 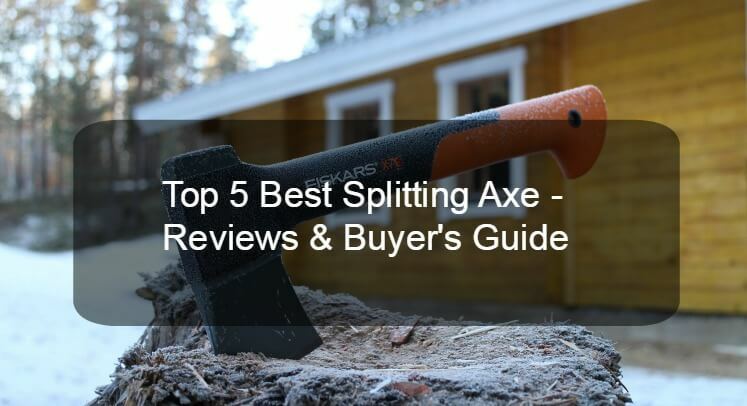 At the end of this article, you’ll have the best splitting axe on your hand. These are the best in the market right now. The first and foremost thing that you need to consider while buying an axe is your purpose. Why are you buying this axe? What are you gonna cut with it? How long do you wanna work with this axe? Cause there are so many options for axes in the market. And if you don’t set your purpose straight you can’t get the best tool out of the market. Sure, there are plenty of multipurpose axe as well but that doesn’t give you the quality of service that you want from your axe or ﻿﻿splitting maul﻿﻿. Length and weight of an axe are one of the crucial factors. If you want to chop bigger and thicker pile of wood then you need to focus on a rather long and heavy axe. But if you want to cut down a small pile of wood and use your axe as a hatched then you need to move to a shorter version of the axe. You need to review what the axe is made of. Both the axe head and the handle. Different materials give different advantages to the axe. Some make it sharper, some make it shock resistant and some make it heavier. Depending on your need you should consider which type of material would be the best fit for you. There are wooden handle, synthetic handle, polymer handle, ash handle and many other options while choosing your desired handles. And the head is mostly made out of forged steel but you need to review if it is laminated or not or if there’s any mix of the chemical in the head or not. You need to decide whether you want a straight hand﻿﻿l﻿﻿e or a curved handle. Curved handle makes it easier to chop down the woods as it feels more natural in the hand. In the other hand, straight handles are easier to control but it creates more friction. So, if you wanna work for longer then curved handle should be the one for you but if you wanna get the work done quickly then you should go for the straight handles. Well, there is the two-bit option while purchasing an axe. You get to buy the single bit ones which are more like a knife and the double bit ones which are more like a dagger. You should select your bit depending on the purpose of the axe. If your work needs axe which has the blade on both sides then you should go double bit otherwise you should go for single bit axes. You have to take into account whether you want a modernised axe or an antique one. If you want an antique one it might cost more penny and if you want a modern one then it might be more productive. You can go to a pawn shop to figure out whether it is an antique piece or not. Any sign of breakage in the product would allow you to get an instant replacement. Very easy to sharpen the head of the axe. The head is soft and sturdy at the same time making it easier to sharpen. The wideness of the blade is debatable because it takes multiple chops for wider logs. Signature bluecolor in the handle. And who doesn’t love blue, right? The axe might break down at the end if any faulty swings are made with it. All of the Estwing’s products have a very long lifecycle; this particular axe will last for decades. Smooth blades make it easier to chop woods in one swing and do not stick to the wood. Signature shock reduction techniques are added to this piece of art as well. Easy to carry and light in weight so it’s a great addition to your camping bag. Good for chopping small logs and medium sized logs. Harder to cut semi-soaked wood with this tool. One piece body makes the handle create more friction with the hand. Can’t use the axe for chopping larger sized woods. It would take more time to do so. The handle is made out of stacked leather so it gives you superior grip on the axe. A laminated coating is provided all over the axe making it immune to rusting. Shock reduction grip makes you work with more ease without worrying. The blade is super sharp and the curves are well balanced making it much easier to chop down big chunks of wood. It can be used both an axe and a hatchet making your investment on it more worthwhile. The leather cover on it is made in Taiwan which is kinda odd considering the whole thing is made in America and it’s a signature American thing. It is hard to operate if you need more power or consider using both hands. The ring area of the handle might leave a minor mark on your hands while using it. Heavy blade makes it easier to cut down a thick pile of woods. It’s completely rust free making your tool last for a very long period of time. The body is made of wood giving you the traditional feel of an axe. The length and the weight are distributed in such a way that it takes less effort to cut down wood and you get a perfect swing every time. The head can be easily sharpened as it is made out of forged steel. The look of this tool is boring! They could easily make this axe into a fantastic looking one. Some say the head of the axe is too heavy to handle. The head tends to get stuck on the log. So, my dear woodpeckers. It is obvious that these axe's are now ruling the axe market and you can’t really point out a best from these few. The best one for you actually depends on your purpose of using the tool.